DNA taken from the wisdom tooth of a European hunter-gatherer has given scientists an unprecedented glimpse of modern humans before the rise of farming. 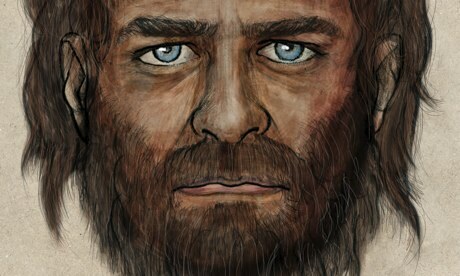 The Mesolithic man, who lived in Spain around 7,000 years ago, had an unusual mix of blue eyes, black or brown hair, and dark skin, according to analyses of his genetic make-up. He was probably lactose intolerant and had more difficulty digesting starchy foods than the farmers who transformed diets and lifestyles when they took up tools in the first agricultural revolution. The invention of farming brought humans and animals into much closer contact, and humans likely evolved more robust immune systems to fend off infections that the animals passed on. But scientists may have over-estimated the impact farming had in shaping the human immune system, because tests on the hunter-gatherer’s DNA found that he already carried mutations that boost the immune system to tackle various nasty bugs. Some live on in modern Europeans today. The Spanish team started their work after a group of cavers stumbled upon two skeletons in a deep and complex cave system high up in the Cantabrian Mountains of northwest Spain in 2006. 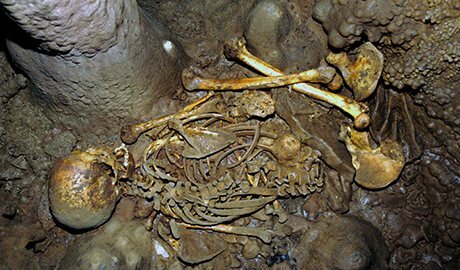 The human remains, which belonged to two men in their early 30s, had been extremely well preserved by the cool environment of the cave. Carbon dating put the remains at around 7,000 years old, before farming had swept into Europe from the Middle East. The timing fitted with ancient artefacts found at the site, including perforated reindeer teeth that were strung and hung from the people’s clothing. The scientists focused their efforts on the better preserved of the two skeletons. After several failed attempts, they managed to reconstruct the man’s entire genome from DNA found in the root of a third molar. 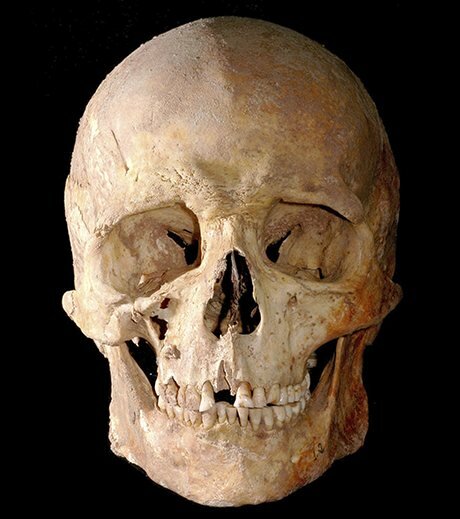 It is the first time researchers have obtained the complete genome of a modern European who lived before the Neolithic revolution. The DNA threw up a series of surprises. When Lalueza-Fox looked at the genome, he found that rather than having light skin, the man had gene variants that tend to produce much darker skin. “This guy had to be darker than any modern European, but we don’t know how dark,” the scientist said. Another surprise finding was that the man had blue eyes. That was unexpected, said Lalueza-Fox, because the mutation for blue eyes was thought to have arisen more recently than the mutations that cause lighter skin colour. The results suggest that blue eye colour came first in Europe, with the transition to lighter skin ongoing through Mesolithic times. On top of the scientific impact, artists might have to rethink their drawings of the people. “You see a lot of reconstructions of these people hunting and gathering and they look like modern Europeans with light skin. You never see a reconstruction of a mesolithic hunter-gatherer with dark skin and blue eye colour,” Lalueza-Fox said. Details of the study are published in the journal, Nature. The Spanish team went on to compare the genome of the hunter-gatherer to those of modern Europeans from different regions to see how they might be related. They found that the ancient DNA most closely matched the genetic makeup of people living in northern Europe, in particular Sweden and Finland. The discovery of mutations that bolstered the immune system against bacteria and viruses suggests that the shift to a farming culture in Neolithic times did not drive all of the changes in immunity genes that Europeans carry today. At least some of those genetic changes have a history that stretches further back. “One thing we don’t know is what sort of pathogens were affecting these people,” said Lalueza-Fox. 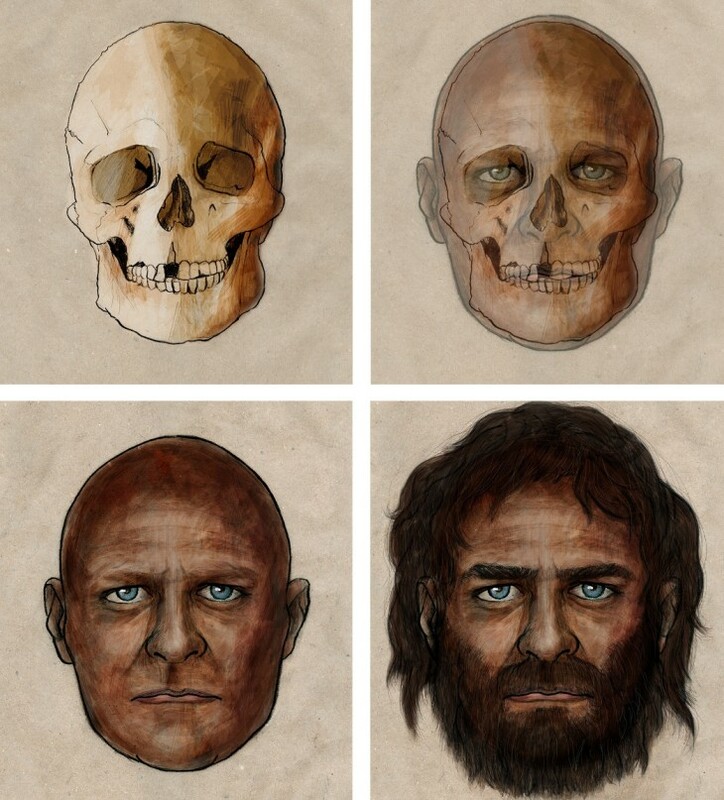 Pelopanton / CSICA progression of sketches shows how a skull and genetic clues were combined to come up with the look of a 7,000-year-old hunter-gatherer who lived in Spain.